Normally it is reasonable to say that this subject is outside our range of job. We are writing about press brake tools because we supply them but automation of bending is the subject dedicated to the manufacturers of press brakes. Yes, mostly true and here is why we made idea for this article. There was the request where the customer want to bend steel with 25 mm thickness. Nothing special and it is possible to offer the quotation but also is necessary to justify could the machine will be able to provide the high tonnage at one area without any damage and deflection. And moreover it was standard Promecam system which is normally only for 100 t/m and the reason to change intermediates for thicker one. All of these things are not standard but not really complicated to deal with and moreover we checked the possibility to supply adapters to move to Trumpf-Wila because for this system and width 20 mm tools 200 t/m could be possible. Ok, but what is here about automation? Will explain. Customer wants to buy press brake tools to start new production. But what is the weight of part? Mainly it was quite small width but more than 35 kg. So how you will deal with it? It is possible to make the project and to calculate everything but how to handle the part of big weight if it will be real typical production with quantities each day? And funny story that customer didn't think about it too. And this means that all our stuff could be completely useless if the customer can't handle the part in production. No, he can organize the handling with two workers or workshop light crane but the constant manual handling doesn't lead to the normal production. So the first reason is not to think about the tools but to know about automation. For several bends and new press brake it could be the following frontal support which follow the part during the bending. But to make the full handling it is necessary to think about automatic or semiautomatic system to move the part or robotic solution. Yes, the first field of automation is not the repeatable massive job but the heavy parts where manual handling is quite hard or impossible. Moreover the market offers also the solutions for existing press brakes to equip them with automatic system. The other story is massive production. Work of press brake operator is not the easy one. He need all the hours to stay at the front of the machine and to make the moving of pieces one by one. If the job really repeatable, robot could be really great solutions to increase the productivity and moreover to enter the mode of 24 hours working shift. Moreover there are different developments to change the jobs, change the press brake tools, change the pallet for loading and unloading of parts etc. It is useful to know that the robot is also very flexible investment if you made the right choice - tomorrow you can move it to other applications and install welding system for example. Robotic sheet metal bending not so massive product like welding cells for example but there are a lot of reasons to run with robots. And it is also the side of the investment to new digital technologies, modern factory and the latest innovations at the field. 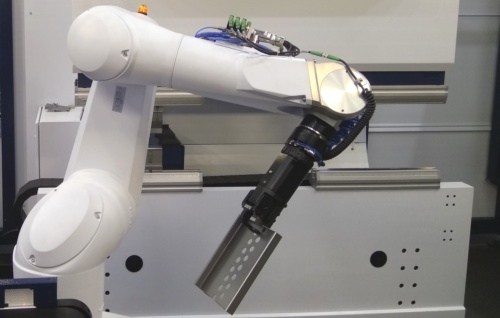 It is interesting also to see that some manufacturers develops also robotic innovations to change the press brake tools with second robot on fly. With one robot it is quite problematic because the necessary to change the gripper. But if you are looking for really fast production and change of working cycles there are possible to supply also special tool racks together with robot or other manipulator to prepare on the press brake new tools for the new job. It is interesting to know that automatic solution could be also not the stand-alone bending cell but the connection to other systems, for example transfer the parts from punching or to and from other areas. There are a lot of fantasies and projects which should be true - several robots for long parts, gantry systems or rails for robots to move it out of press brake area if necessary to work by operator again, small work of punching station, fastening operations etc. In addition automatic cell is the part for digital factory or Industry 4.0 which is today the first name to develop the modern workshop.